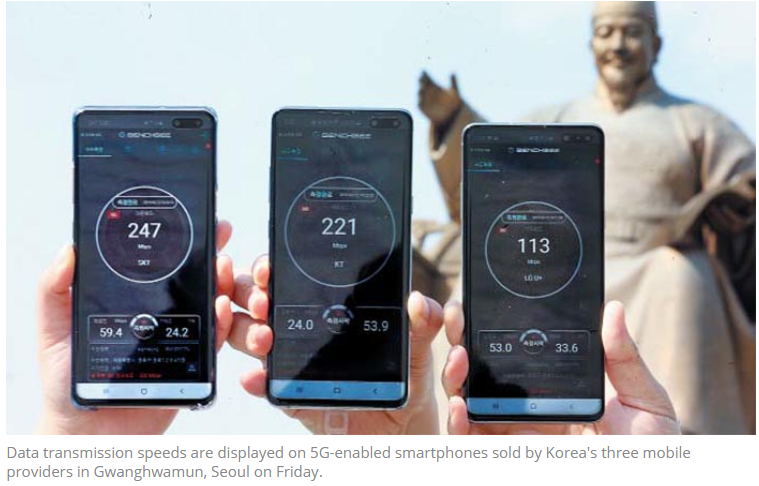 As the Chosun Ilbo English edition reported yesterday, 5G mobile service in Korea is "off to a rocky start." The three mobile service providers were unable to deliver the speeds expected by customers who purchased 5G compatible phones. 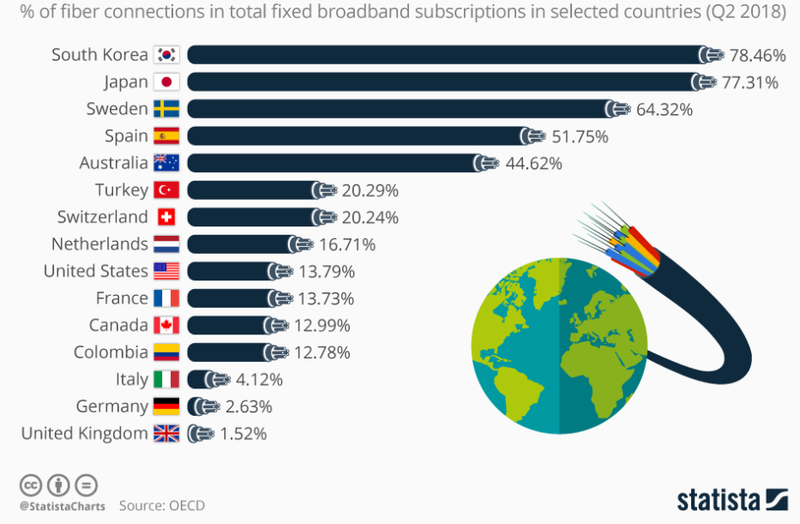 The slower than expected speeds delivered by 5G compatible phones were widely covered in Korea's mainstream media. The Korea Joongang Daily reported that "LG Electronics has been in talks with mobile carriers to delay the release of its first 5G smartphone to ensure stable service." As reported in The Korea Times SK Telecom is working with the Korean Military Academy to build a smart KMA. 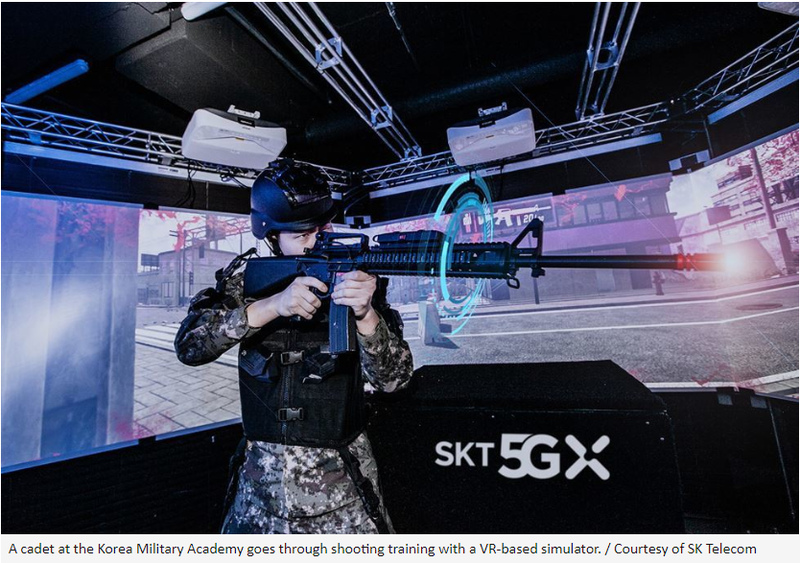 It will feature "...high-end fifth-generation (5G) networks, enabling cadets to conduct military exercises using virtual reality (VR) and augmented reality (AR) technology... Under a business agreement, SK Telecom and the Army's elite school will cooperate in developing a smart KMA with 5G networks and other cutting-edge information and communications technologies, such as artificial intelligence (AI), AR, VR, the internet of things, cloud computing and big data." The goal is to introduce advanced technologies based on 5G networks in all areas of activity at the Korean Military Academy. 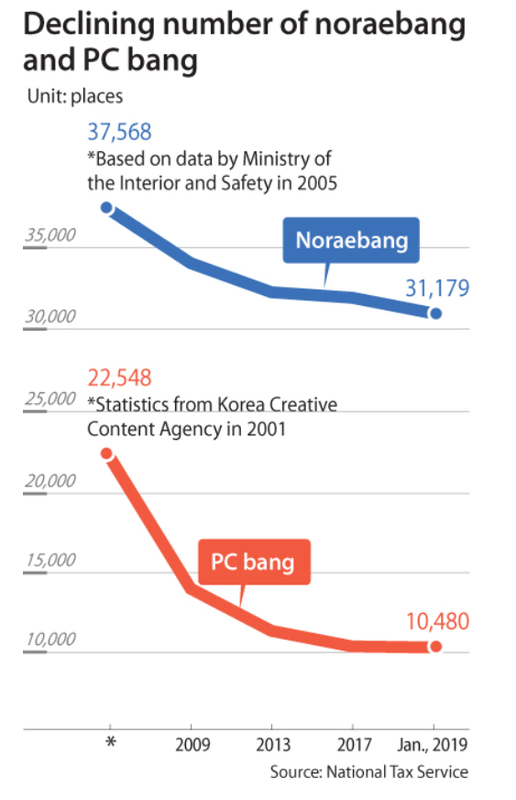 The Korea Joongang Daily today reports on the decline of both PC Bangs (Rooms) and Norae-bangs (Korean style Karaoke rooms). As readers of this blog will know, I've posted frequently on this topic over the years. Based on data from the national tax service, the Korea Joongang Daily reported that Korea had 10,480 PC Rooms as of January 2019. (click on the graphic for a full-size version). 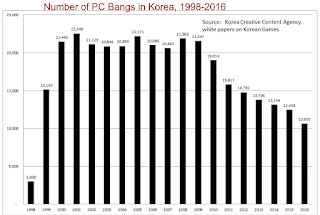 This figure caught my eye because I had recently updated a bar chart showing the number of PC Bangs in Korea for inclusion in my forthcoming book (with Myung Oh), Digital Development in Korea: Lessons for a Sustainable World. 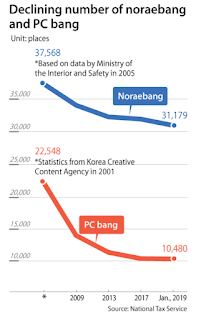 That chart, also shown here, indicated that the number of PC Bangs had decreased to 10,655 by 2016, the last year for which data were available from the Korea Creative Content Agency. Clearly, the pattern from 2016 through January of 2019 is one of the total number of PC Bangs leveling off. 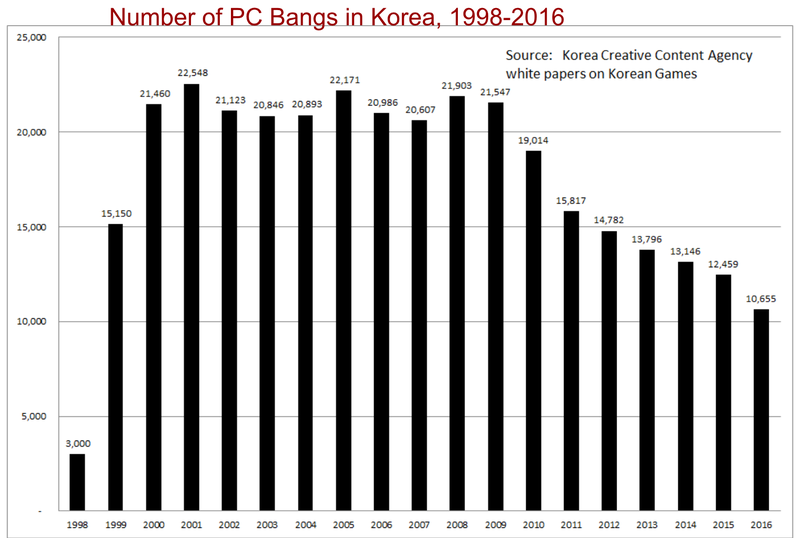 Given developments in the game industry, the growth of e-sports and the rising popularity of mobile games it may be that 10,000 or so PC rooms represents the number that are needed to meet continued consumer preferences in the Korean marketplace. 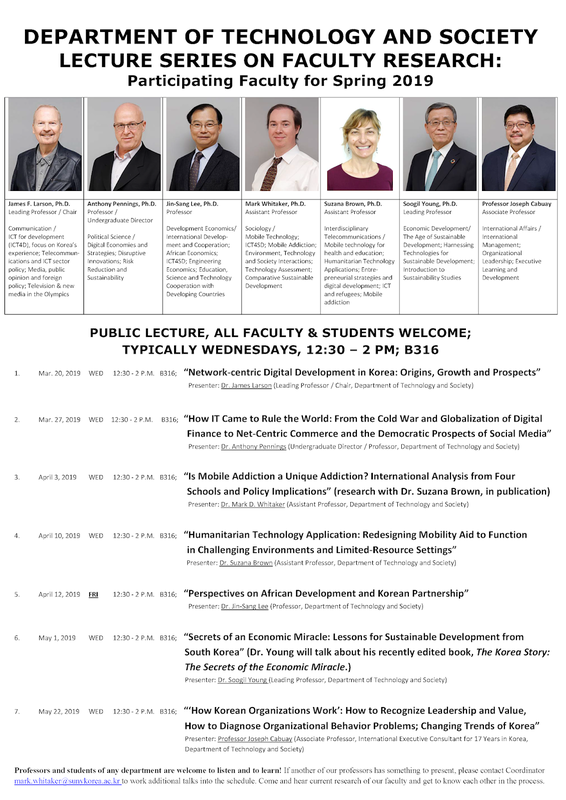 My department at SUNY Korea (Department of Technology and Society) launched a formal lecture series this semester (click on the poster for a full size version) and I had the privilege of giving the initial presentation on the topic "Network-centric Digital Development in Korea: Origions, Growth and Prospects." 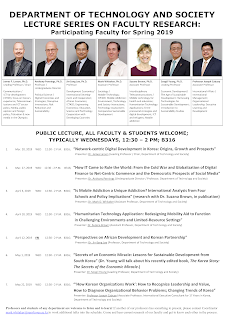 A thank you to Professor Mark D. Whitaker for organizing this series. For readers of this blog I thought the lecture series and a couple of photographs from my presentation would illustrate another aspect of what I do here from day to day. For me personally, the series provides a welcome chance to learn more about the research being pursued by my departmental colleagues.